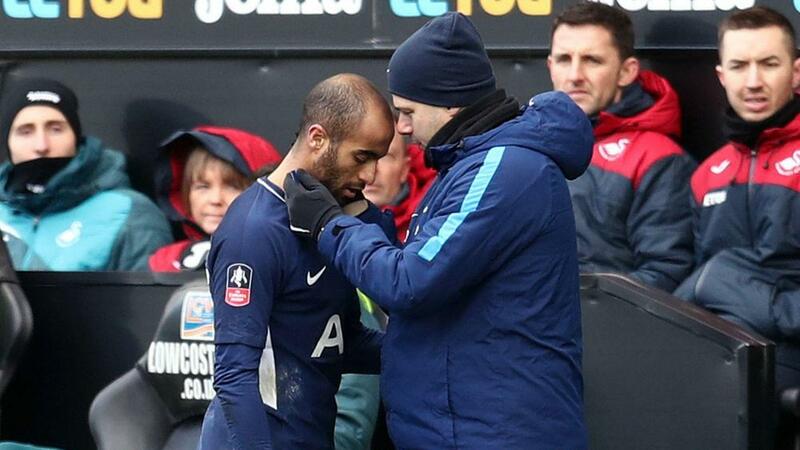 Mauricio Pochettino says he is likely to rotate his squad a little more for Tottenham's remaining games, hinting Lucas Moura will be one of the main beneficiaries. Lucas arrived at Spurs for a reported £23million fee in January having fallen out of favour at Paris Saint-Germain following the arrivals of Neymar and Kylian Mbappe. Although the Brazil international impressed in a handful of FA Cup appearances, scoring once and setting up two more across a couple of clashes with Rochdale, he has not been a regular for Pochettino. He has hardly featured in the Premier League, with his three substitute outings seeing him accumulate just 48 minutes on the pitch. After appearing from the bench in Saturday's 3-1 defeat to Manchester City, Lucas looks likely to get more playing time under his belt in Spurs' final games of the season, starting with Tuesday's trip to Brighton and Hove Albion, as Pochettino prepares to rotate ahead of the FA Cup semi-final with Manchester United. Speaking to reporters at Monday's news conference, Pochettino said: "Maybe it will be his [Lucas'] opportunity to play a little bit more. "There are a lot of games still to play. Of course now maybe it's a moment to rotate players that are tired. "It's been a tough season and we need fresh legs to get the objective. Yes, he [Lucas] is one of the players who is working hard, trying to take the opportunity. "Maybe tomorrow [Tuesday] is a good opportunity for him to play a little bit more." Pochettino also suggested Toby Alderweireld will be in the squad, potentially making a long-awaited return. The Belgium international has not featured in the Premier League since October, with several injuries and a contract impasse said to be the main causes for his absence. "Yes, Toby is going to be in the squad," Pochettino added. "Tomorrow [Tuesday] I will decide whether he's going to play or not." Fernando Llorente should be available for selection too, having left Wembley early on Saturday for personal reasons. "It was a personal issue. I cannot explain, but I can tell you that everything is OK," Pochettino said. "Of course we are going to keep private what happened. It was a personal issue but now everything is OK and he is going to be involved in the game, for sure."